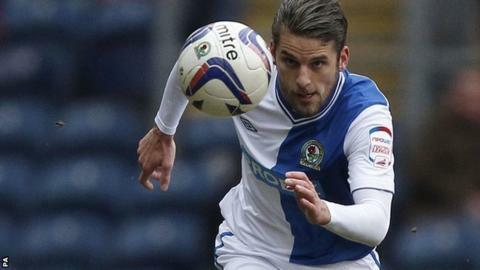 Play-off hopefuls Blackburn and Leeds were both left frustrated after a goalless draw at Ewood Park. The best chance of the first half fell to the home side but keeper Paddy Kenny saved from Colin Kazim-Richards. In a match of few chances, Leeds forward Ross McCormack failed to make the most of the visitor's best one, firing wide from Steve Morison's pass. The goalless draw against Leeds gave Blackburn a fifth clean sheet in nine games under manager Michael Appleton. Rovers forward Jordan Rhodes sidefooted an effort into the side-netting and neither side could break the deadlock. The result leaves Leeds six points off the play-off places, with Blackburn one point further adrift. The home side, giving first starts to on-loan pair David Bentley and DJ Campbell, began lethargically and Rovers defender Grant Hanley twice had to block bravely from McCormack. Hanley also thwarted Morison before Luke Varney put the rebound wide from the edge of the area. Danny Murphy found Kazim-Richards, who forced Kenny into a smart save low to his left to keep the game goalless at half-time. McCormack spurned a chance at the other end after the break when he was found by Morison only to shoot wide and the game ended with the respective defences comfortably on top. Blackburn manager Michael Appleton: "When I walked into the football club nobody had any thoughts whatsoever about getting into the play-offs. "I think a lot of the damage was done before I arrived but, saying that, there's 13 games to go. "The message to the players after the game was you just need to keep knocking on the door. If you keep knocking on the door and asking questions hopefully someone will slip up, and generally someone does." Leeds boss Neil Warnock: "You don't tend to come away to Blackburn, end up 0-0 and be as disappointed as we are. "I don't know how we've not won the game really. I never thought they were going to score, even at the death when they had a couple of corners. "I thought we were super at the back, did well in midfield - you've just got to take your chances."